How Much Vitamin D3 Can a Woman Take in a Day? Everyone needs vitamin D, but the amounts needed and the possible benefits of taking higher amounts of vitamin D are hot debate topics in medicine. Two forms of vitamin D are available as supplements, vitamin D2, also called ergocalciferol and D3, called cholecalciferol. D3 is the form synthesized by the skin and D2 is the type synthesized by plants. Most supplements contain D3, according to the Linus Pauling Institute, which may be better utilized by the body. Women may realize particular health benefits from vitamin D supplementation. The recommended dietary allowance describes an amount sufficient for the needs of 97 to 98 percent of healthy people. For females, the RDA does not change from age 1 until age 70, but remains at 600 International Units per day. At age 70, the RDA increases to 800 IU per day. The RDA for vitamin D was raised in 2010 based on a number of research studies indicating that current standards were too low. The tolerable uptake levels indicate the highest dose that will not cause toxicity. The tolerable upper limit for women and girls over age 9 for vitamin D is 4,000 IU daily. Do not take this much D3 without your medical practitioner's approval. You cannot get too much D3 from the sun; dietary intake also is unlikely to result in too much D3. It is possible to overdose on D3 supplements, according to the Linus Pauling Institute. Of the 40 million Americans who have or are at risk for developing osteoporosis, 68 percent are women. Vitamin D in any form alone doesn't appear to lower the risk of developing fractures or of reducing falls, according to the Office of Dietary Supplements. Giving both vitamin D and calcium does increase bone density, according to the Women's Health Initiative Study conducted by Ohio State University researchers and reported in the Feb. 16, 2006 "New England Journal of Medicine." A review of literature conducted by Harvard Medical School and Brigham and Women's Hospital and reported in the March 2006 issues of "Cancer Causes and Control" looked at cancer studies and vitamin D. Researchers concluded that data related to decreased breast cancer risk was insufficient to state definitively that there was a correlation between the two, but that further research was needed. Studies related to colorectal cancer do support the theory that low vitamin D levels may be associated with colorectal cancer. Taking too much vitamin D can have significant risks. Because vitamin D assists in calcium absorption from the intestine, very high vitamin D levels can cause high calcium levels as well. Symptoms of high calcium levels include weight loss, bone loss, kidney stones and heart irregularities. 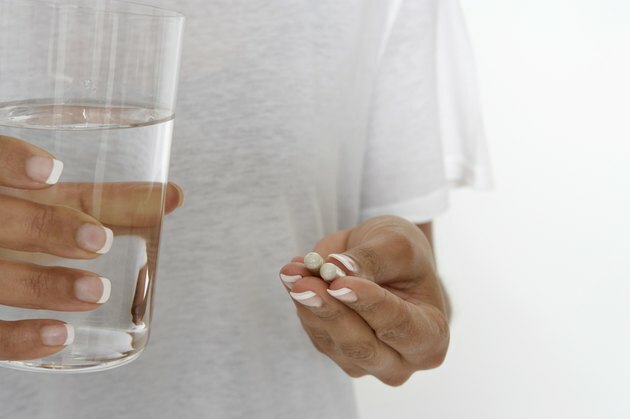 The Women's Health Initiative Study 2006 report also found a 17 percent increased risk of kidney stones over a 7-year period in women taking 1,000 mg of calcium and 400 IU of vitamin D daily. Women to Women: Is Vitamin D Deficiency Casting a Cloud Over Your Health? Marcelle Pick, N.P. Do Low Vitamin D Levels Indicate Cancer?